CANVAS lacquer just released their Spring Fling collection which is now available on their Etsy site; the entire collection will all be featured in upcoming posts over the next few days! 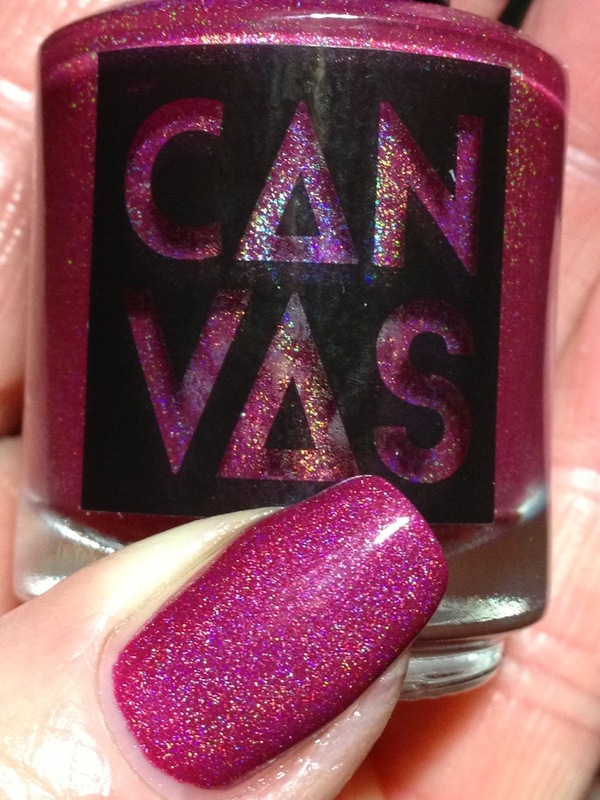 This is Tempts Are Rising by CANVAS lacquer. I found that the colour ranged from a deeper berry to a brighter fuchsia depending on the lighting which can be seen in these two pix as the hand pose is pretty much the same in both; any way it leans, it's still stunning! 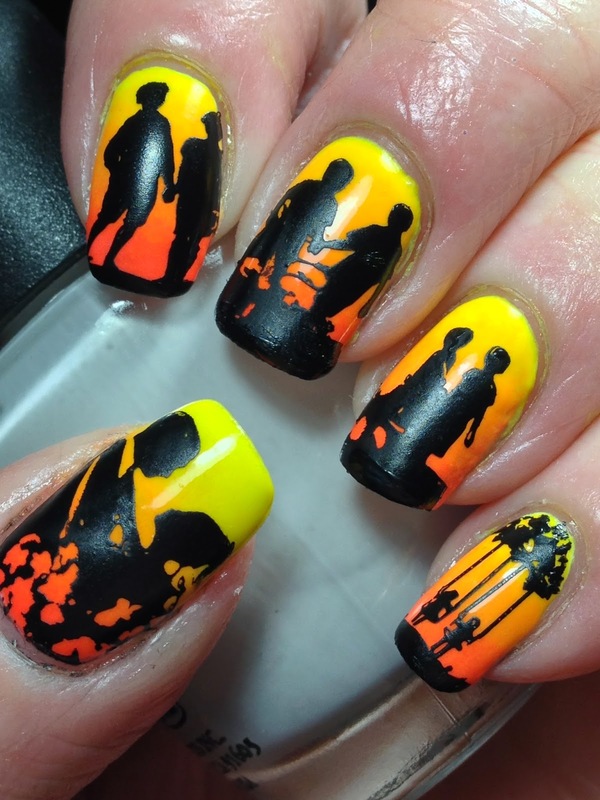 The above pictures are two coats, no top coat. Application was good in two easy coats; removal too was a breeze; no problems to report! 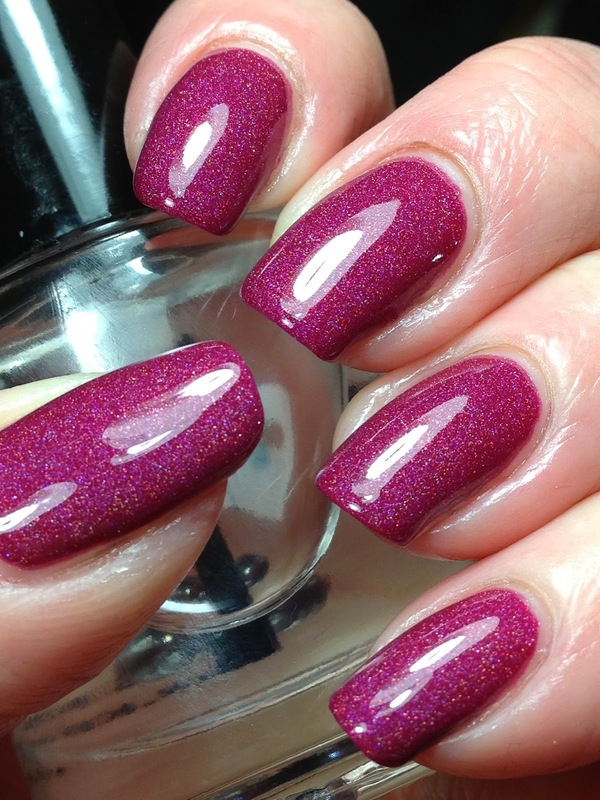 TEMPTS ARE RISING – this bold berry shade has an oh-so sparkly linear holographic finish in a juicy crelly base. 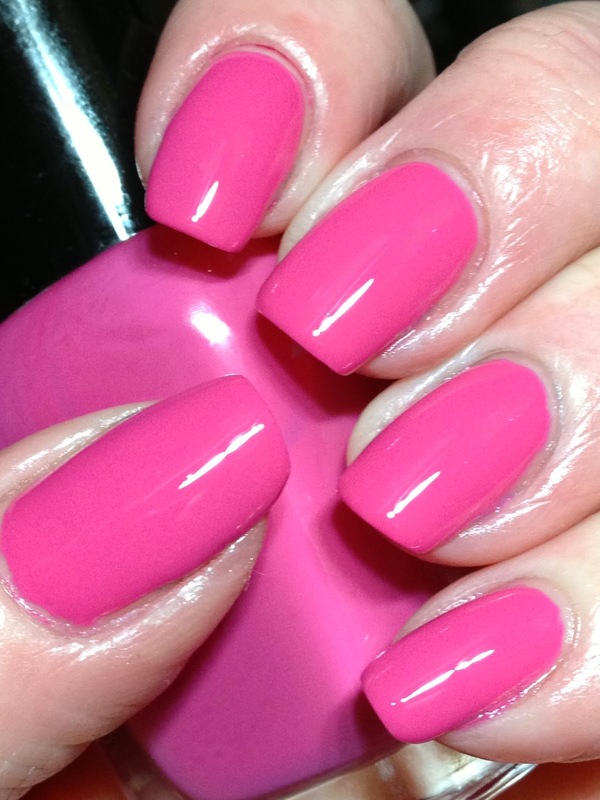 There’s nothing shy about this polish, plan to catch a lot of admiring eyes. 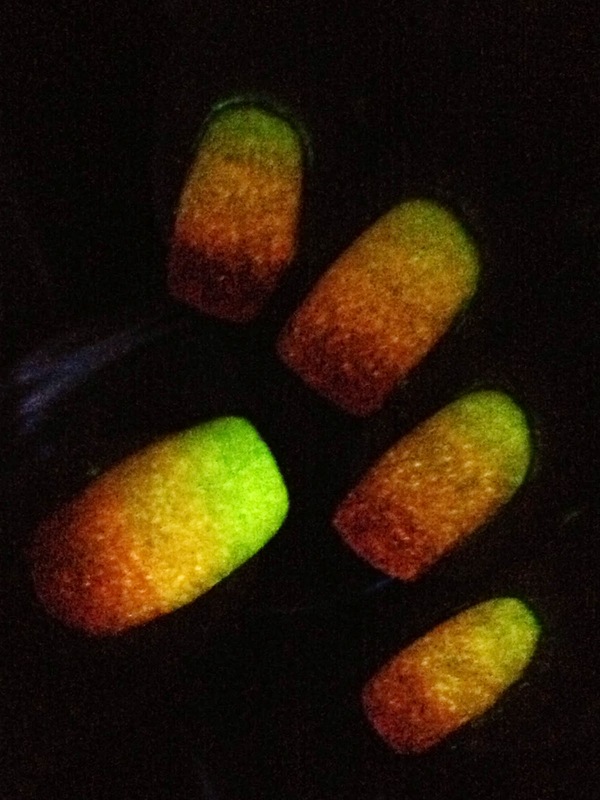 I had read over at CANVAS lacquer's blog that Tempts Are Rising is their first linear holographic polish and it seems like they got the holographic flame right; look at the holo flame glowing - this baby could roast marshmallows!! I was oddly fascinated with the holo peeking out of their lettering here........! 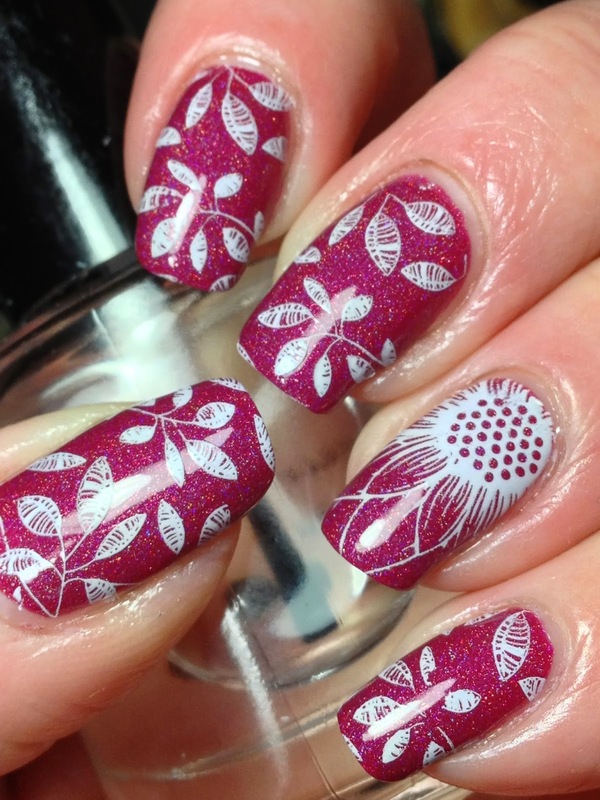 For stamping, wanted to use an image that you could still see the luscious base under; went with images from UberChic 1-02 using Mundo de Unas #1. 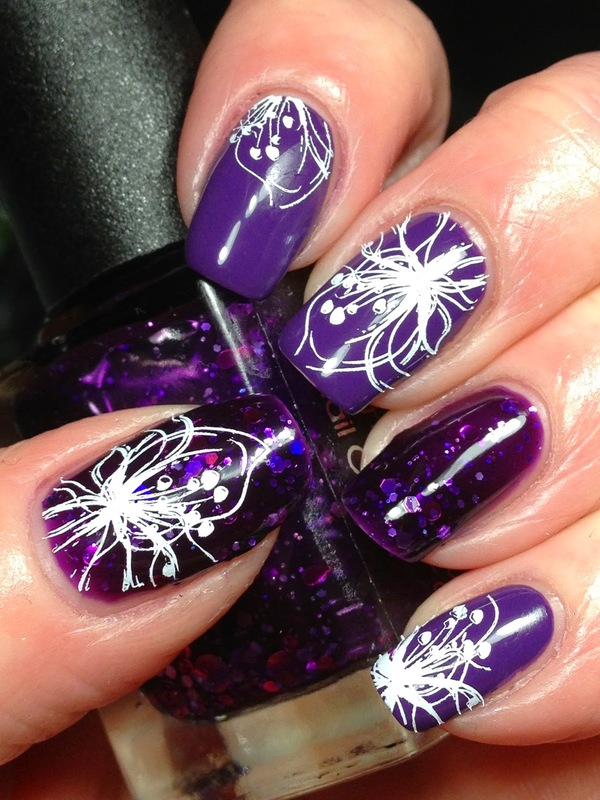 Top coated again with KBShimmer Clearly on Top to finish. 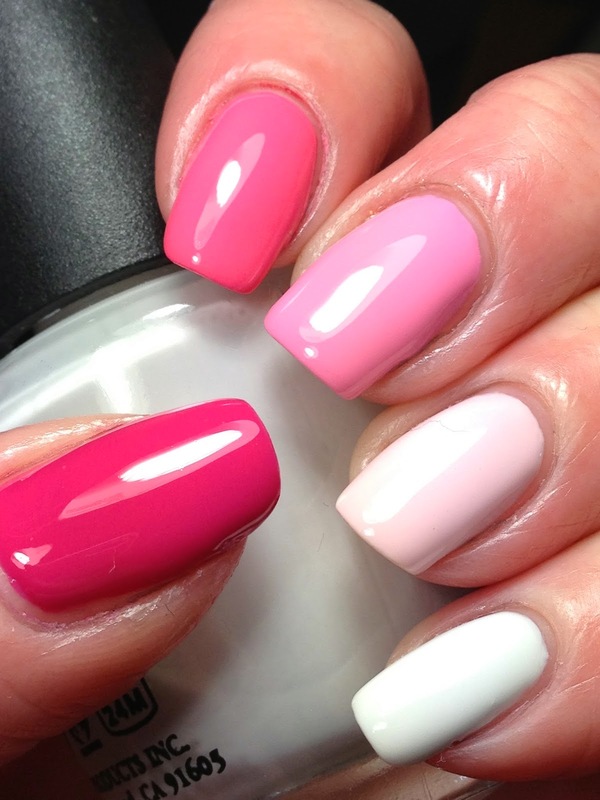 CANVAS lacquer's Spring Fling collection is available via their Etsy shop here! They do ship international to select countries; see their shop for full details! 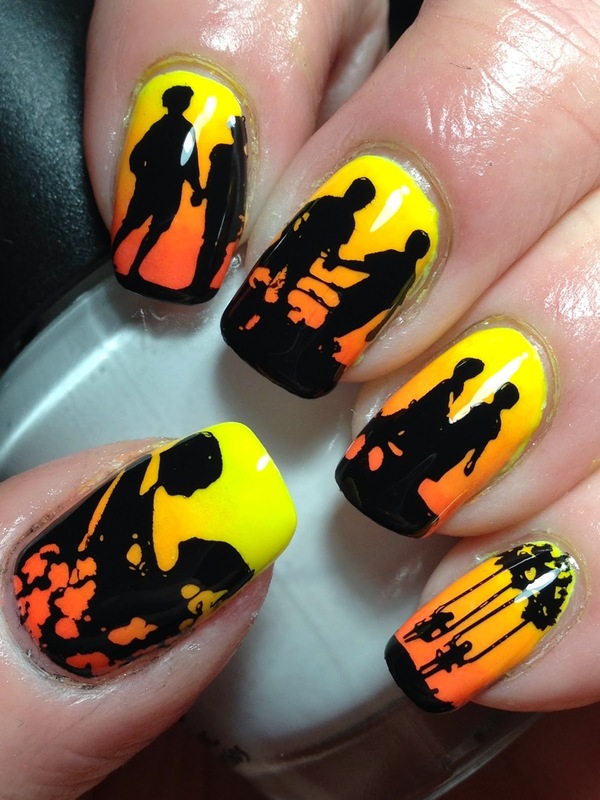 If you are in the GTA, CANVAS lacquer showcases at a variety of events; please be sure to follow their blog or Instagram account to see where they are at! It seems I'm never in town when they have an event....or the weather is poor, making it tricky for travel...but I do hope to visit them at a show sometime! Hold Onto Your Seat If You're A Purple Lover! Purple lovers rejoice! This one's for you! I picked these polishes no no other reason that I hadn't worn purple for a while and thought they would go nicely together! 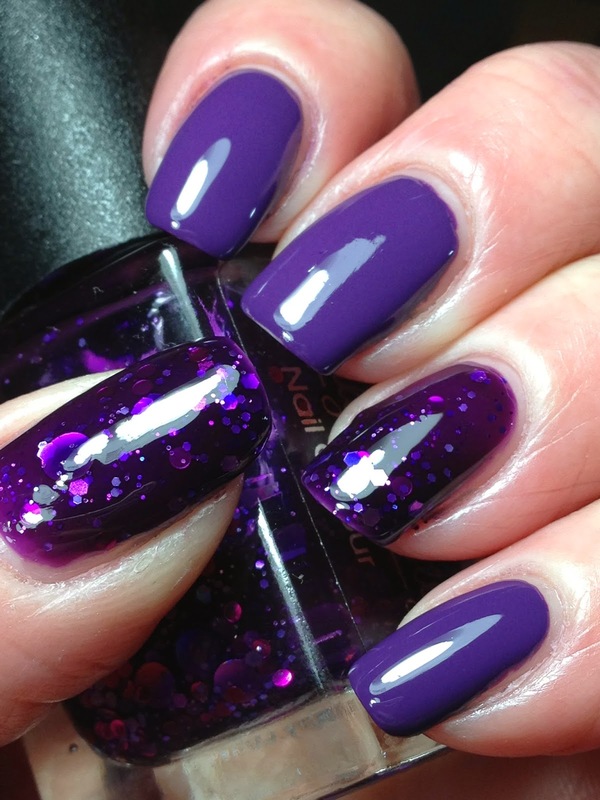 I started by choosing Emily de Molly Cosmic Forces, this is three coats. 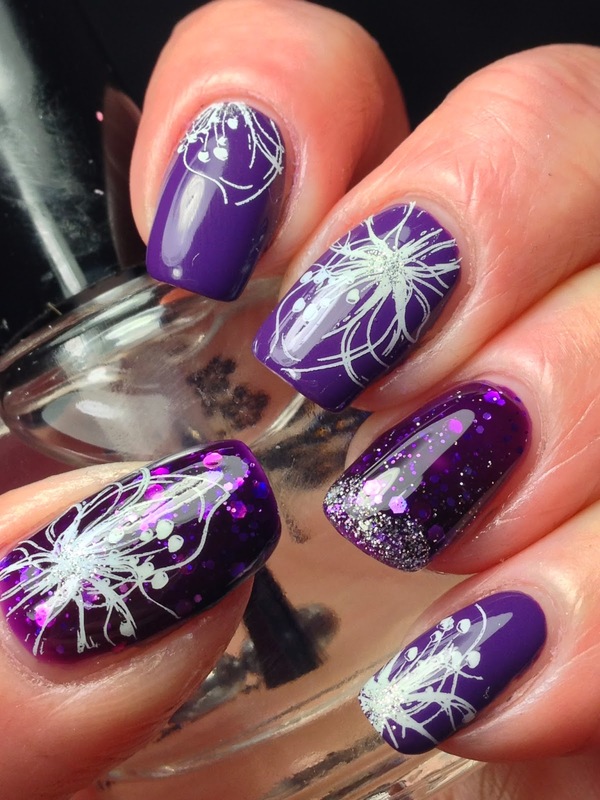 Then picked a purple creme that I thought would go well with it; FingerPaints Picturesque Purple, two coats then top coated with KBShimmer Clearly on Top. I would have liked more of the big circle glitters on my nails but only one came out in six coats total. Stamped using Mundo de Unas #1 (white) with an image from UberChic 1-03. I had a hard time getting this image to stamp; I tried Funky Fingers Gesso and it would not stamp at all so I had to switch to Mundo de Unas. 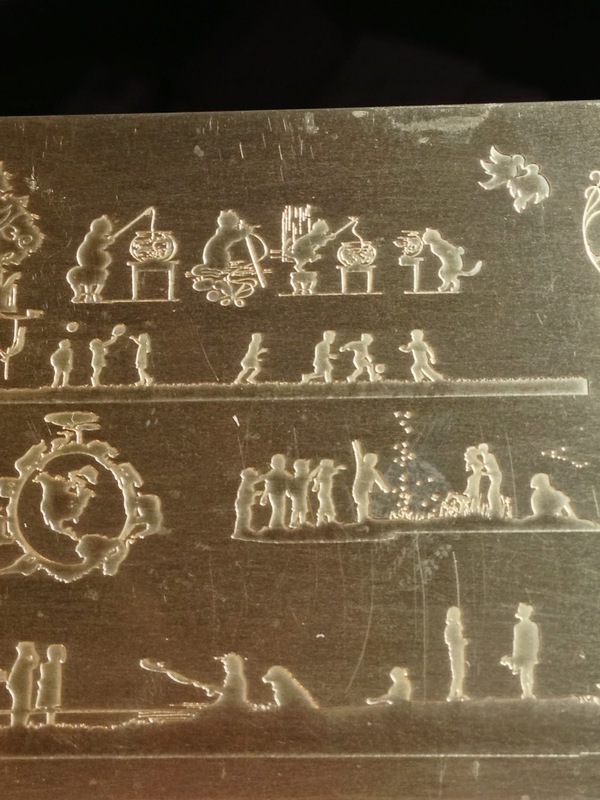 Even with Mundo de Unas, the plate had to be wiped each and every time after stamping or the image would not pick up at all. 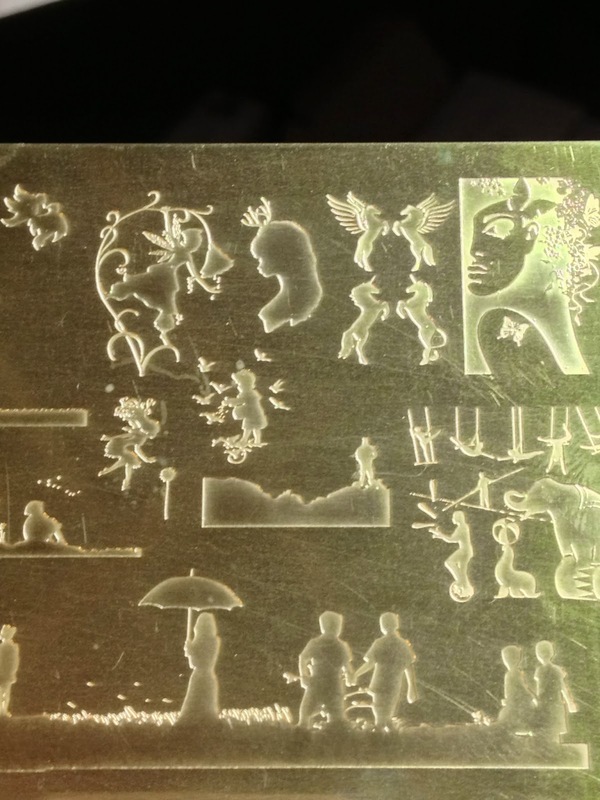 I'm surmising this is because the etching depth and image lines are fine. 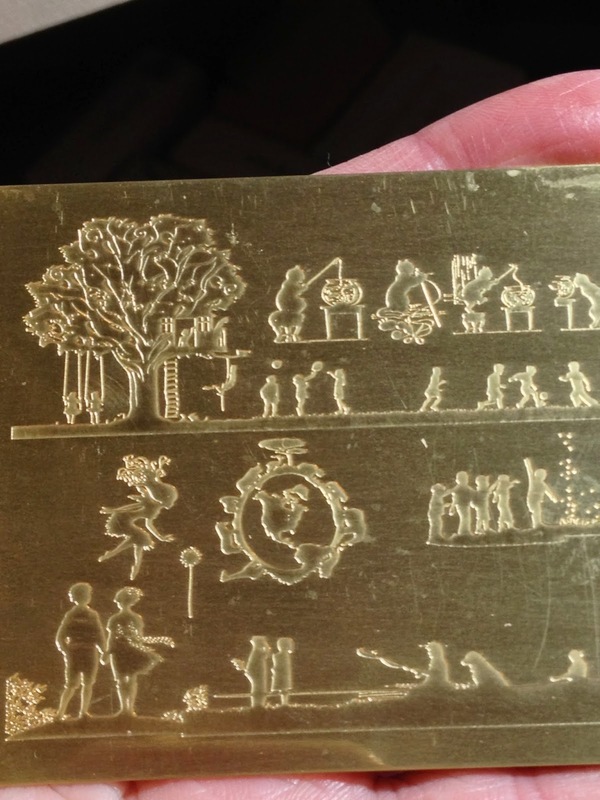 I'm not sure if the plates are just finicky by nature or if I got poorly etched plates because I've used four images from these as I write this post and all are the same. 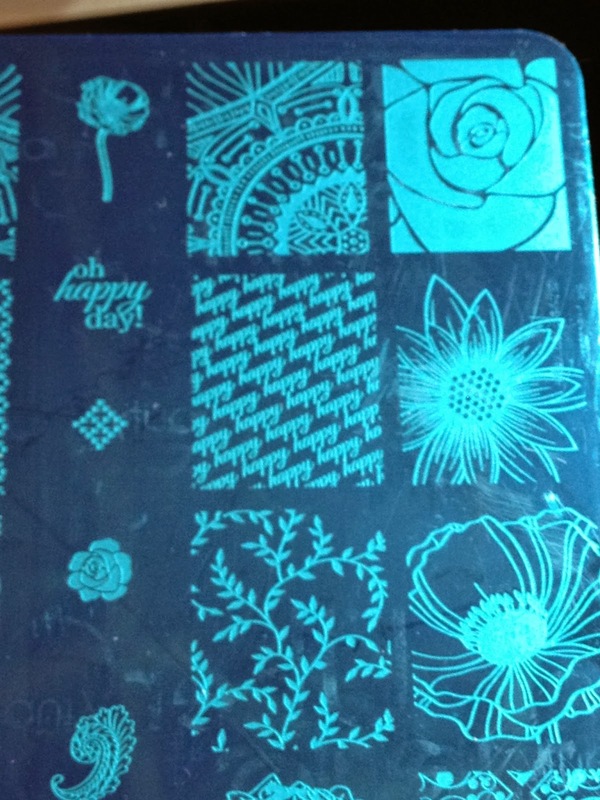 What is also odd is that everyone else is giving these plates such glowing reviews but no one is saying if they are wiping their plate after each image and if they will only work with certain polishes. Yes, they do stamp but if you have to wipe after each and every stamp and they work with only certain polishes, they are more finicky that I like myself. Has anyone else experienced this? Maybe I just got poor plates or could be that I have higher expectations from a plate. ?? 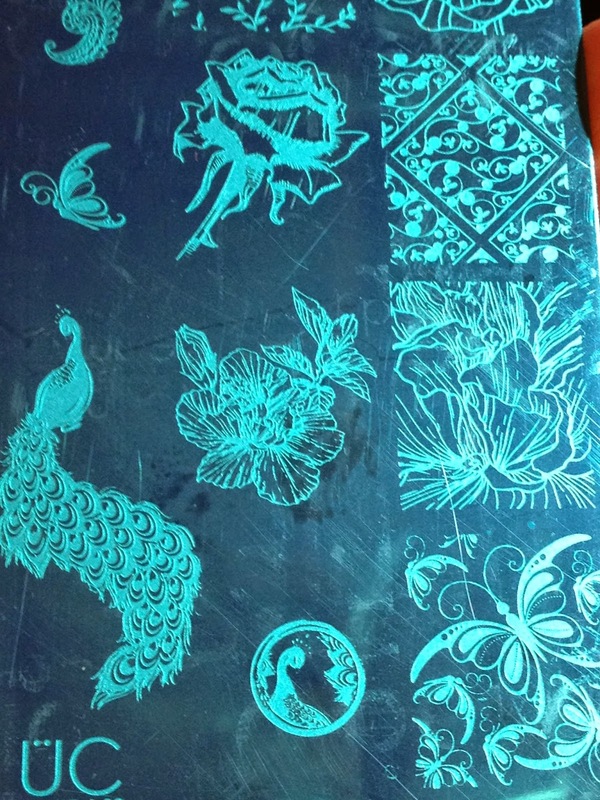 (Edited Feb 22, 2015: I tried numerous stampers, scrapers and polishes last night on this image; Magno, squishy from Messy Mansion, firm rectangular from Messy Mansion, FAB, MoYou squishy) and they are all the same; the etching is so fine/shallow that you can only get one stamp and you have to clean up or it will not pick up. Not one stamper would pick it up a second time and some wouldn't pick it up the fully the first). 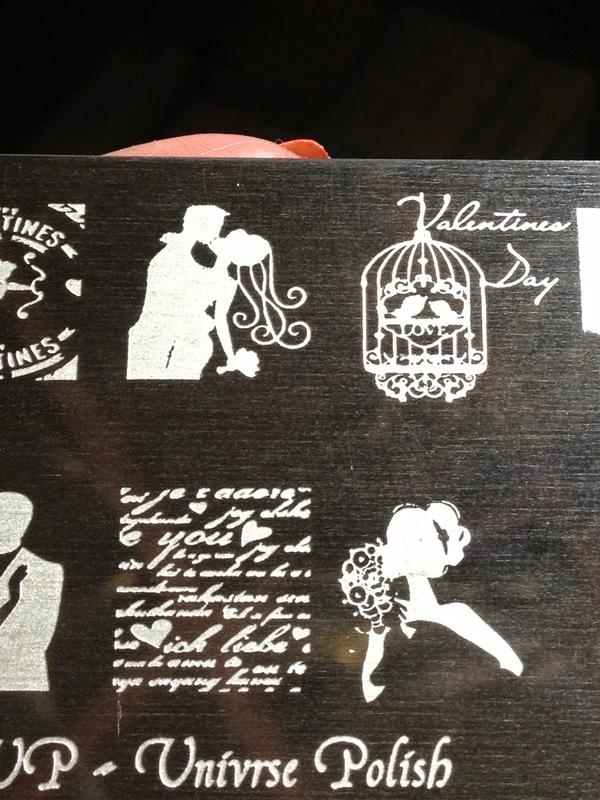 While the stamping on itself was nice enough, I like a little more interest. 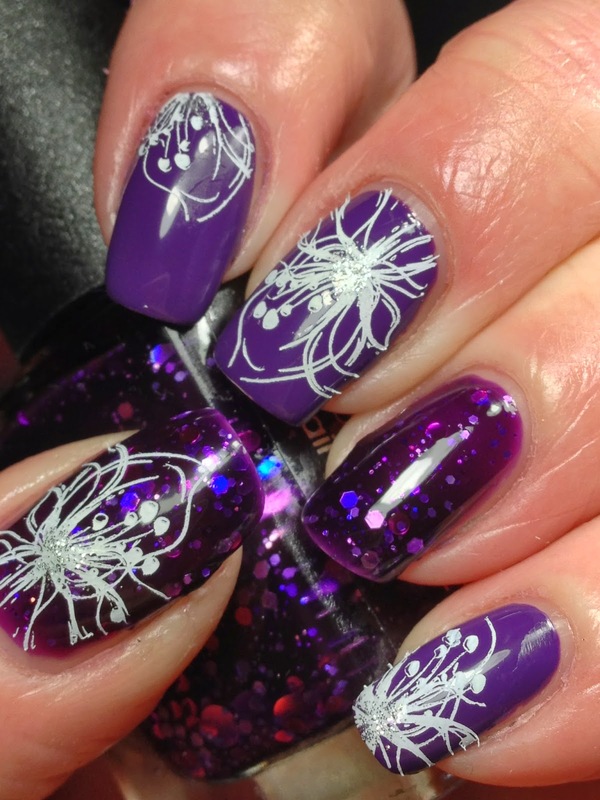 Added NYX Silver to the centers of the flowers. I love the look of the glitter in the jelly polishes so purposely didn't want to do much stamping on them and opted to leave the ring finger with the base alone. Hmm, again didn't mind the look of this, but thought the ring just looked too bare. I made a wavy line using tape and wave scissors; I really wants several rows of waves and then the silver glitter on top but the tape wasn't the best for making these waves and I don't have waves nail vinyls at the time I did these (I do have some now thanks to the package I received for a Canuck Swap I was in!). 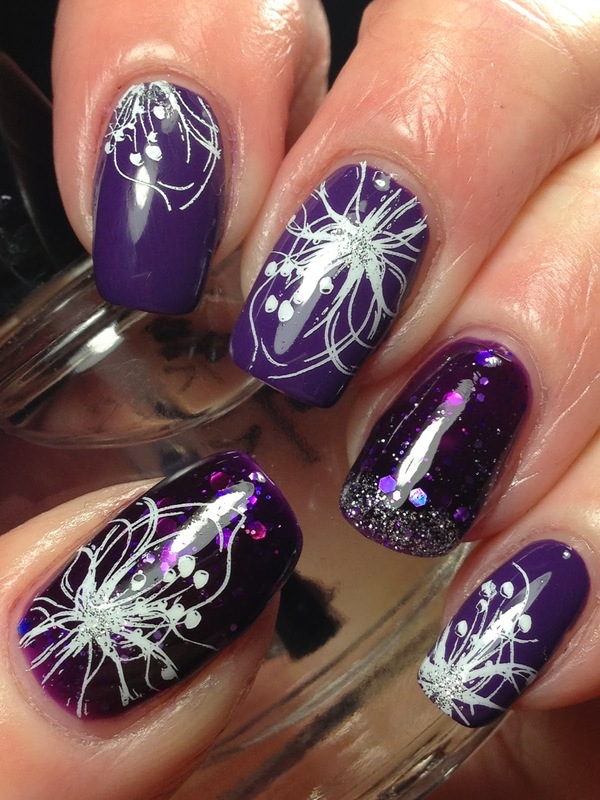 So just left the silver glitter at the tips for interest and to tie in that finger with the rest. 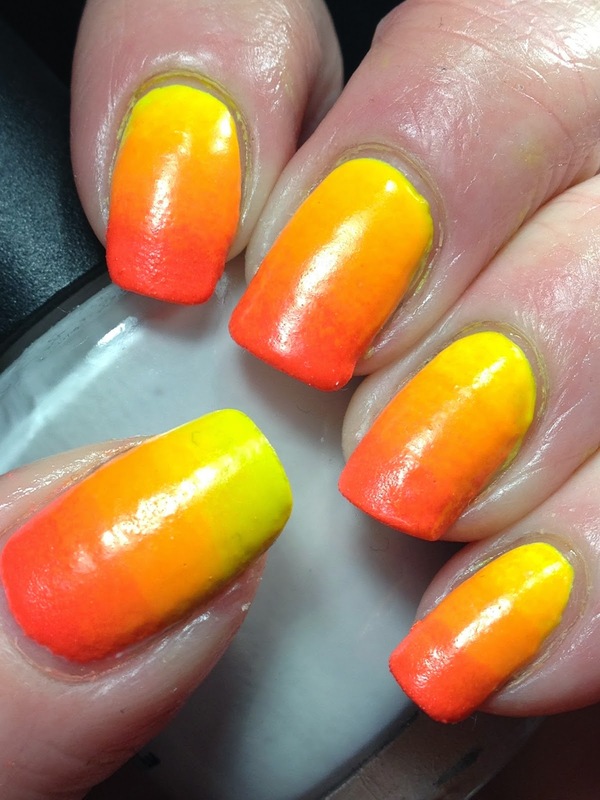 Then top coated to finish to KBShimmer Clearly on Top. Some of the silver glitter spread on the ring finger but I actually think it added to the look! Sometimes oops works! 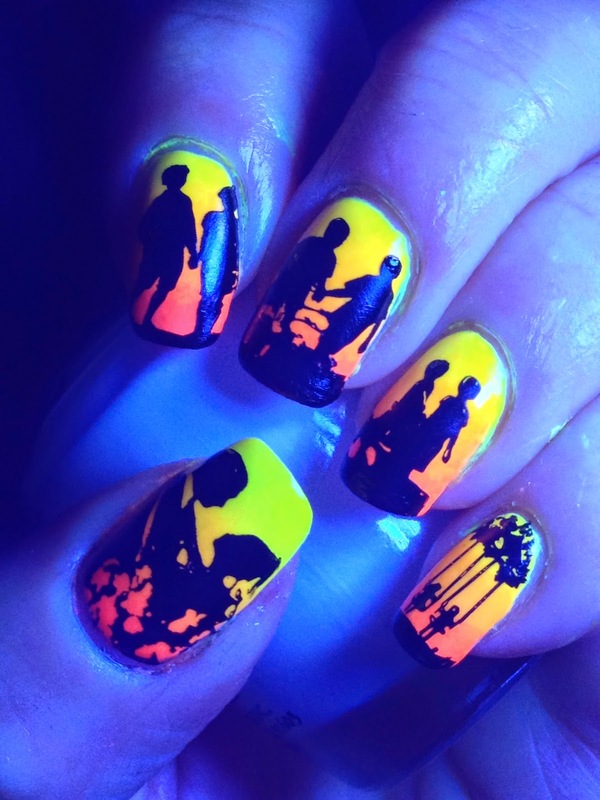 You can also see that this particular image is way too big for my nails. So I stamped it in an assortment of ways to compensate for this; I myself really like the partial whimsy images on the pinky and index. Thank goodness or otherwise a useless image for anyone with smaller nails! 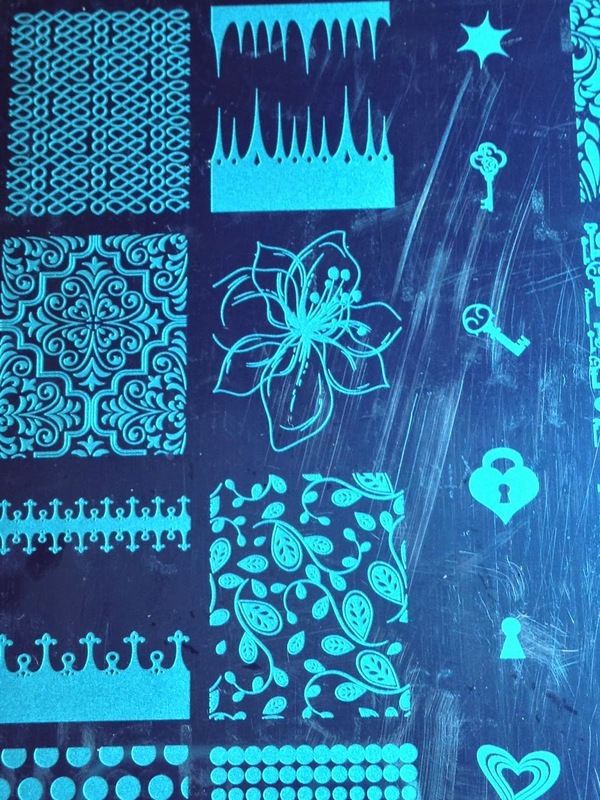 And if you have these UberChic plates, are yours finicky too? Please let me know! I had ordered a few Serum No. 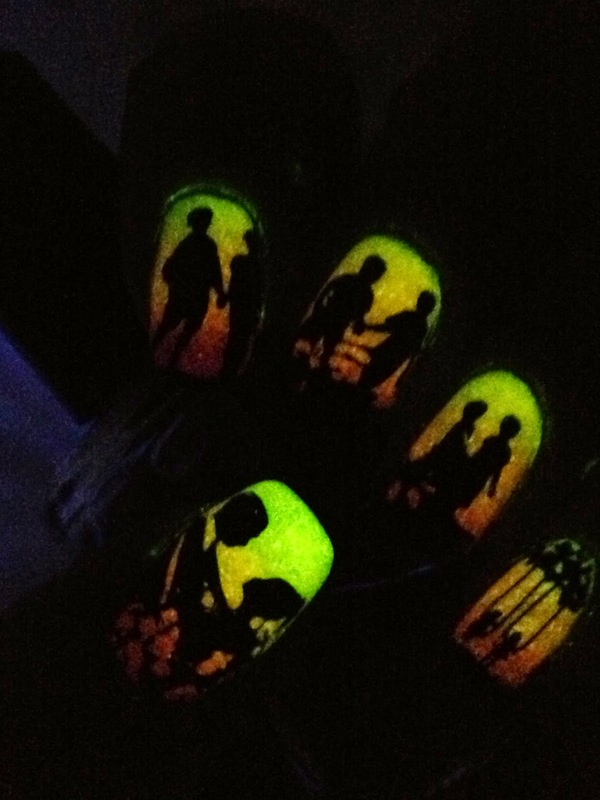 5 glow in the dark polishes in January and was finally able to use them a week or so ago. 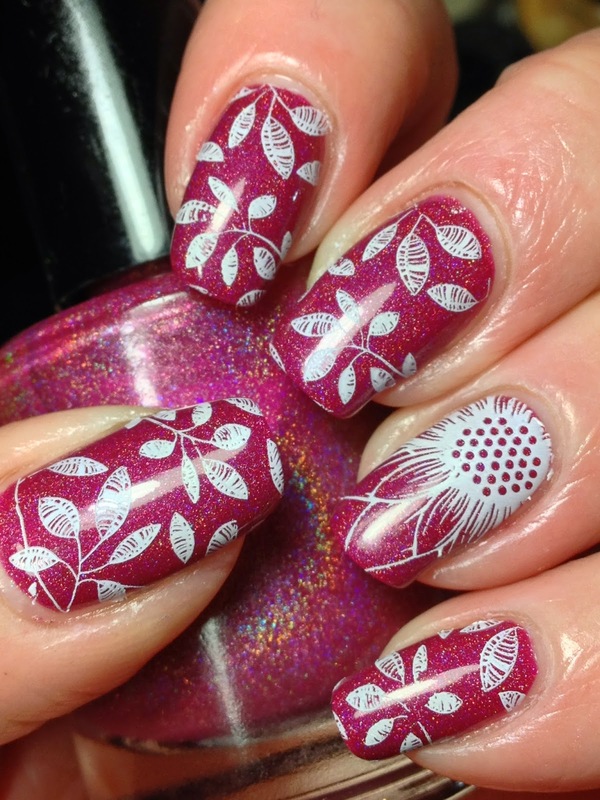 I did this mani with the hopes for sharing at Valentine's Day; I've shared a few pix of the base and some of the stamping on IG but haven't done a blog post about it. Until now; that is! Not very Valentine's Day-ish anyway! 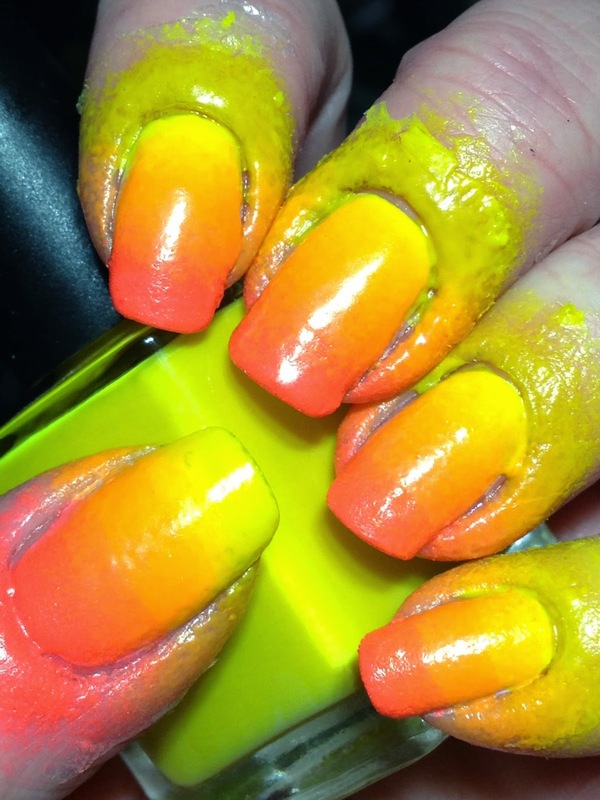 Started with a base of two coats of OPI My Boyfriend Scales Wall to make brights pop; no pix. 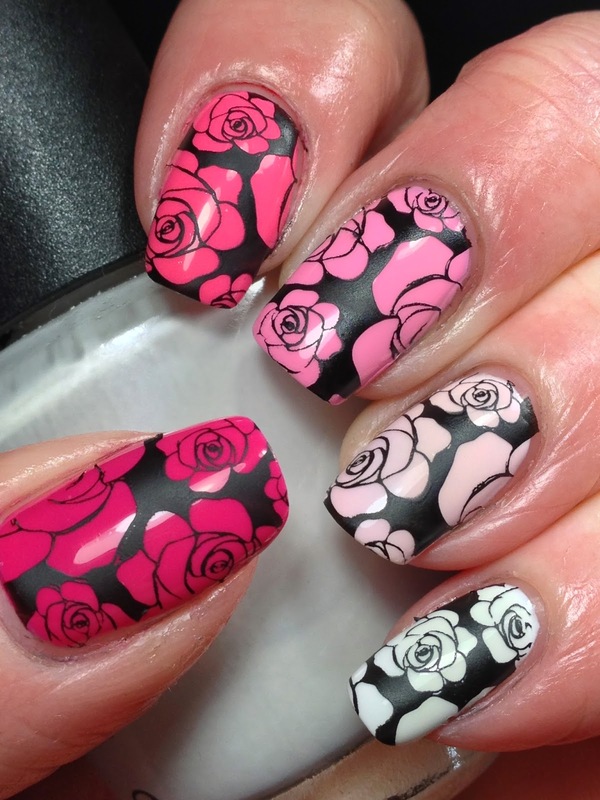 Wrapped nails with glue remover. Waited to dry before sponging; once it was dry enough, sponged on a gradient of Serum no. 5 Solar Power, Orange You Sunny and Infared. I had a terrible time with the glue remover. First of all, when I posed for this pix, the glue stuck together where my fingers were touching so started to come off in pieces...then I could not for the life of me get it to come off in one piece but rather bits and pieces. Just had a terrible time getting if off overall. I haven't used the glue enough to know if my coats were too thick, too thin or what but it took me longer to get off the glue bits then without any glue at all. This was after a lot of cleanup; and still not the best. I found the polishes pretty thick and I did fairly generous amount of sponging, mainly because I wasn't happy with my gradient. 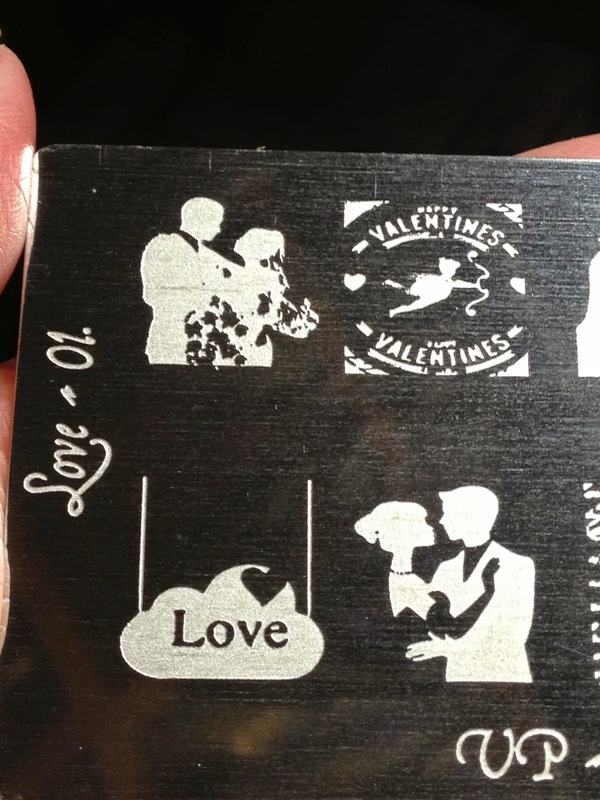 Even here, it's not the best but because I knew I was stamping on it and would cover a great deal of it, left as is. I had bought a black light thinking that the glow in the dark would show up best with it....and it does, but man, the skin colour is off the charts! 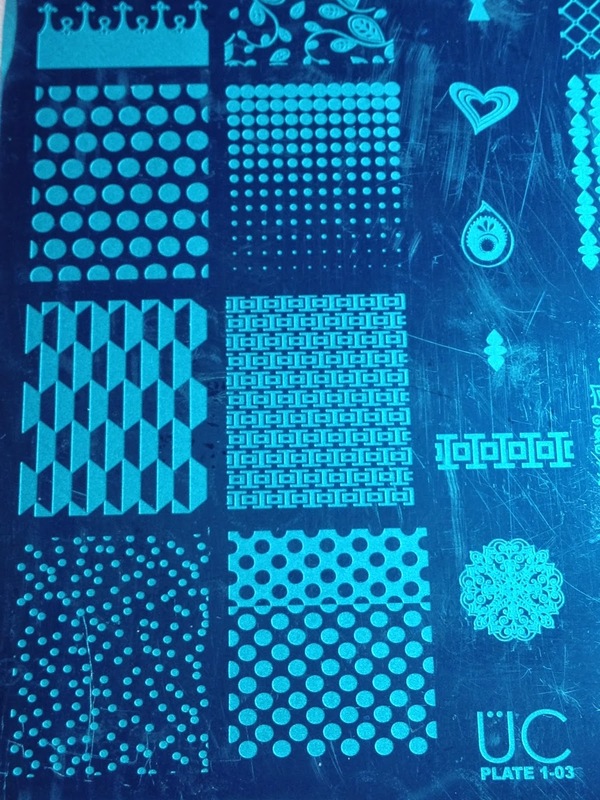 I wasn't sure if top coat would affect the glow in the dark, but top coated anyway as I knew I'd be stamping and it helps as a protective layer if I have to remove a mis-stamp. 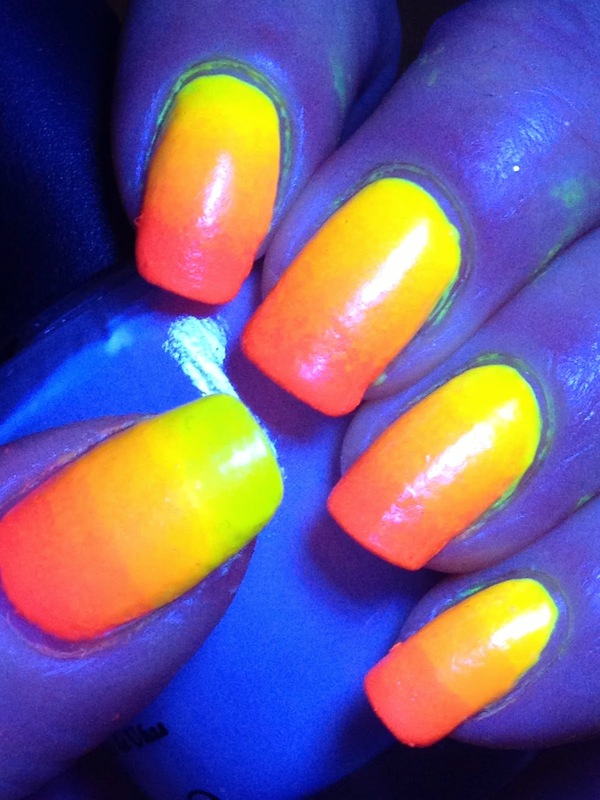 Pleased to report that top coat didn't effect the glow at all! 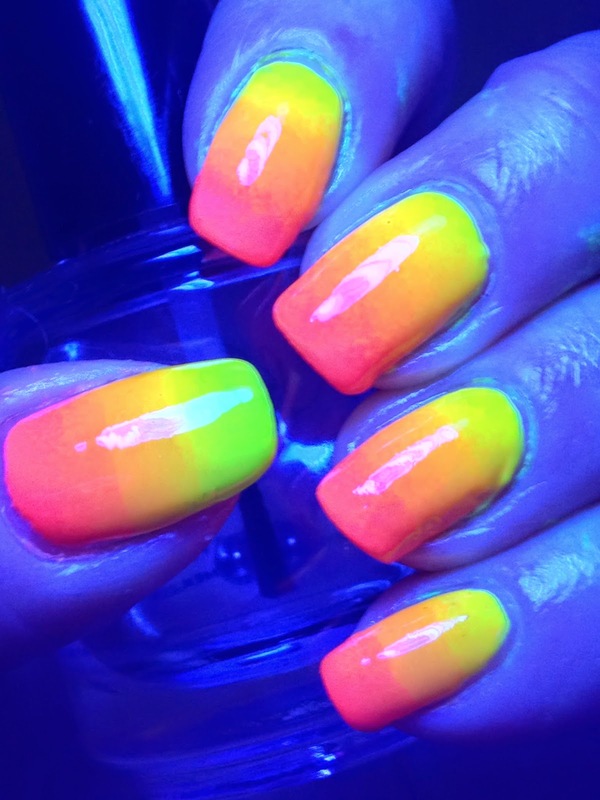 It was around this time that I thought this must not be how you use the black light for taking these pix; so I charged the polish using the black light then moved my hand away from the light into a dark void; this is the pix taken after charging. Sooo cool to have colours glow in the dark versus the more typical blues and greens! Black light before top coating. Charged with black light but taken in the dark. Can't tell if top coated or not lol! 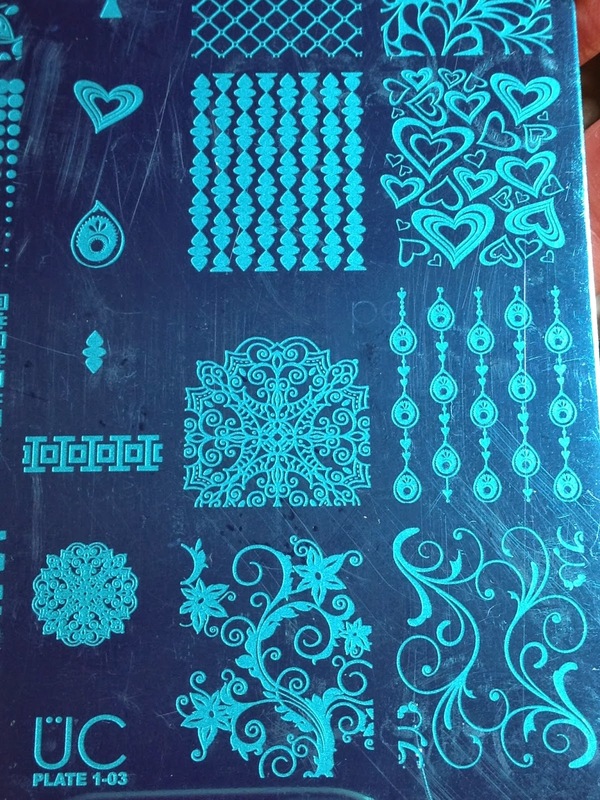 I have so many ideas on how to use these polishes for stamping! 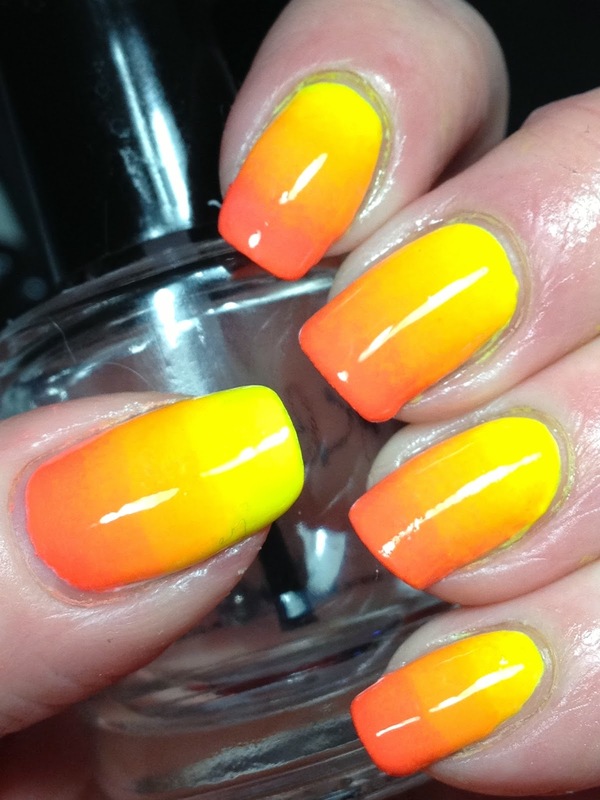 While I only picked up the neon colours; I do want to eventually get the pastels too! Serum No. 5 polishes are available directly from their online shop; I ordered most of them direct and they do ship internationally. 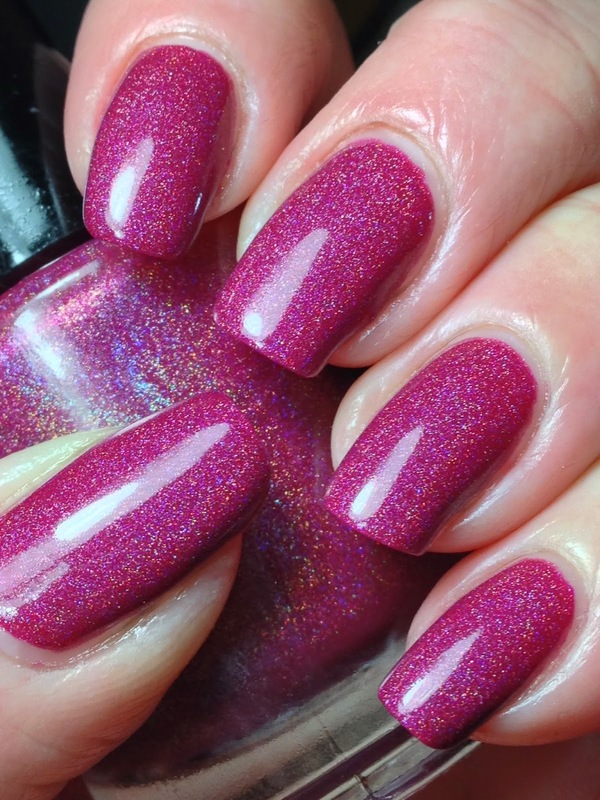 Other stock lists include Harlow & Co., llarowe and Hypnotic Polish. 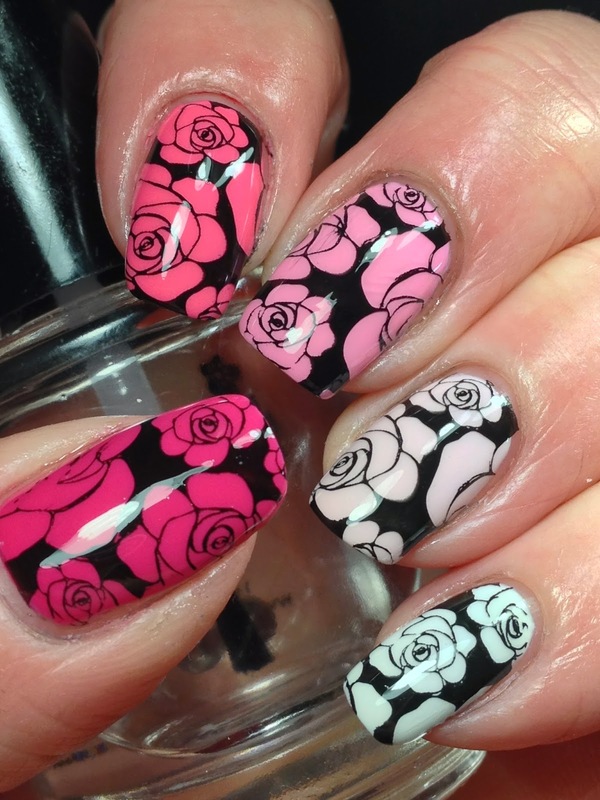 I did this mani with the hope of sharing before Valentine's Day but that didn't happen unfortunately! None the less, I think it's pretty enough to wear for anytime so I'm sharing it now! Started with a base of ombre skittles; colours starting at the thumb and going clockwise are CND Raspberry Parfait, CND Sweet, CND Girlie Pink, Essie Romper Room and OPI My Boyfriend Scales Walls; all two coats, topped with KBShimmer Clearly on Top. 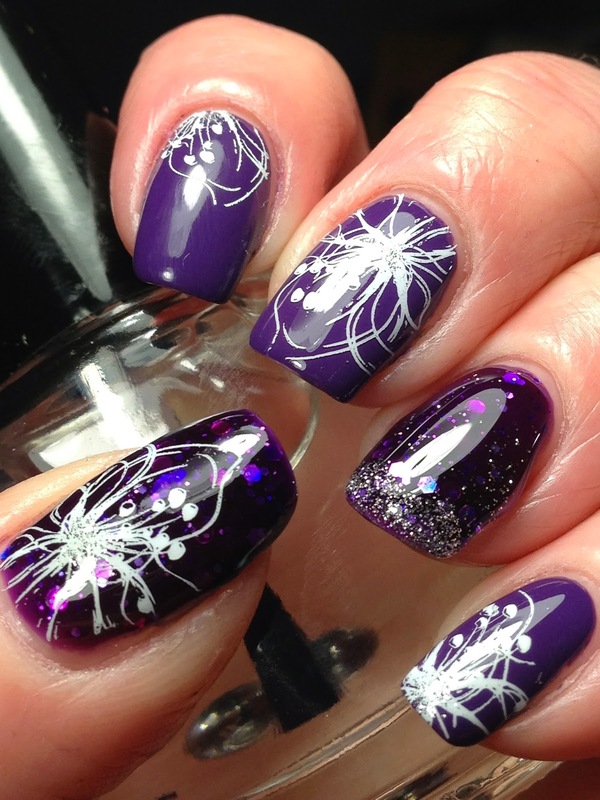 Stamped using Funky Fingers Dark Knight using UberChic 1-02. A closer look at UberChic 1-02. For the other hand, I did white stamping using Funky Fingers Gesso. 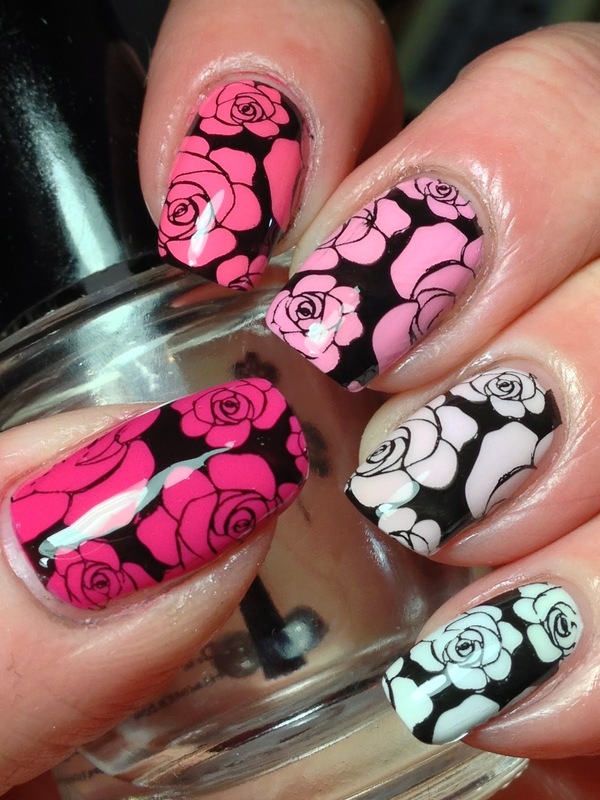 On the pinky which had the white base, I triple stamped using the single rose image from the same plate, using three of the CND base polishes. 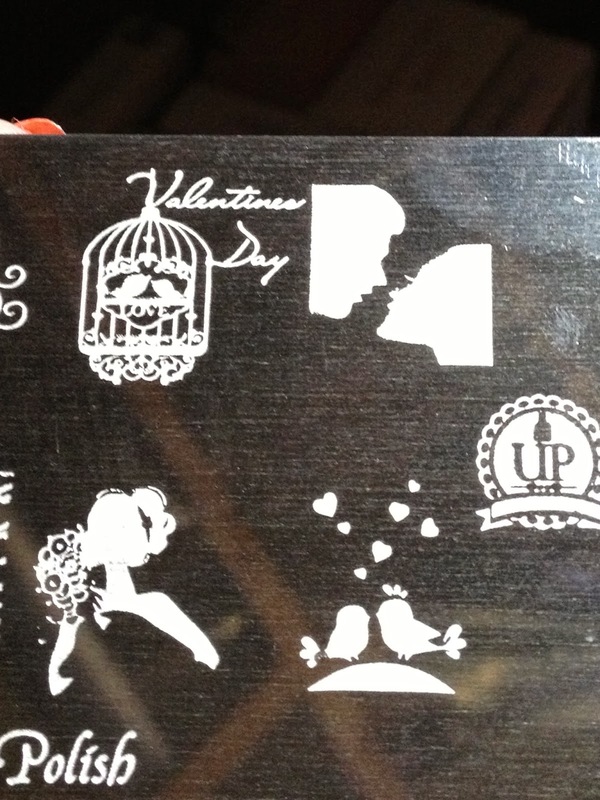 I was lucky enough to have an online friend pick up the plates and mail to me but UberChic does ship internationally. Their site is here! 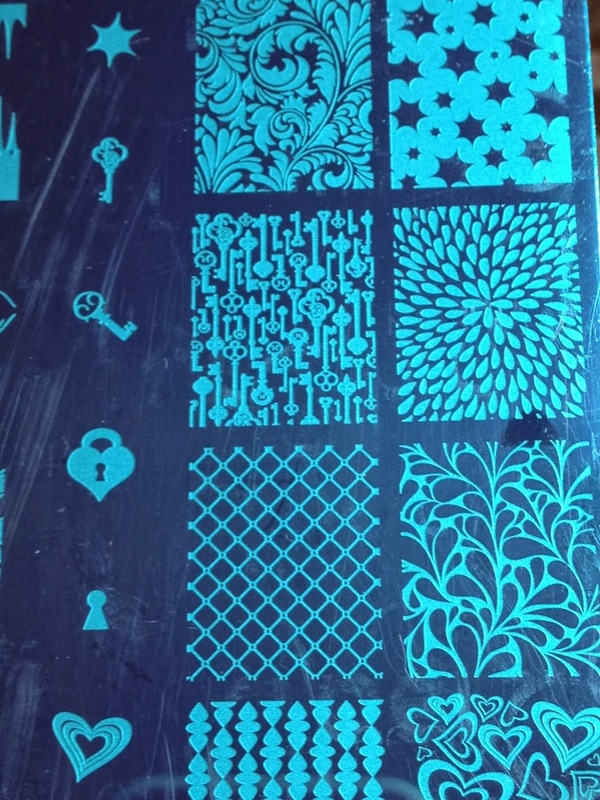 We are at Day 5 of the hardest Digit-al Dozen challenge ever; patterns on patterns. Hard for me; but by the looks of the other ladies, mani's, it was easy peasy! 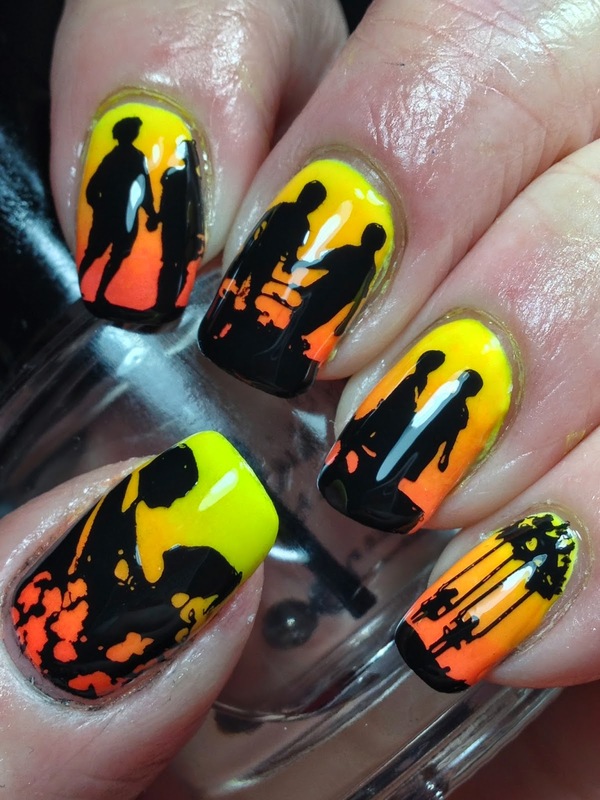 Hopefully you have had a chance to check out all the ladies creative mani's this week as there have been a lot of crazy cool mani's, that's for sure! 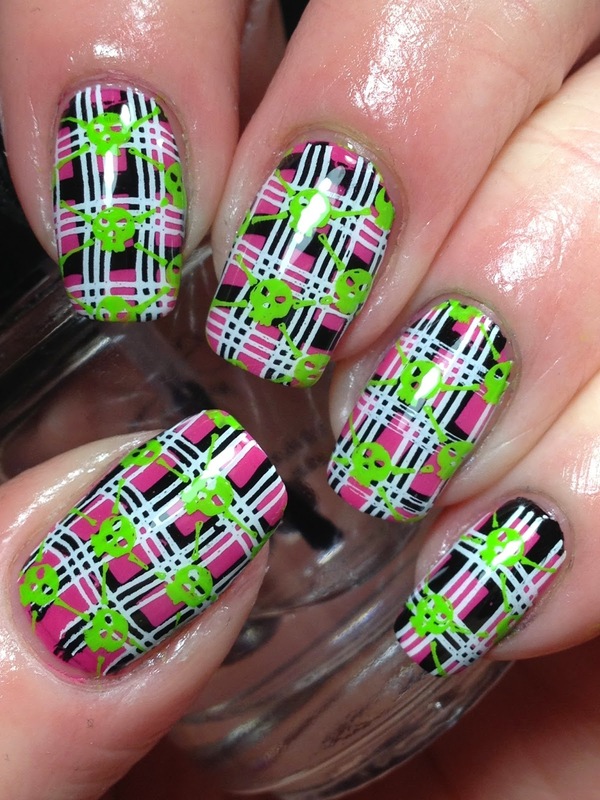 This is my final mani...and I went all out with pattern on pattern on pattern! Here's what I came up with! 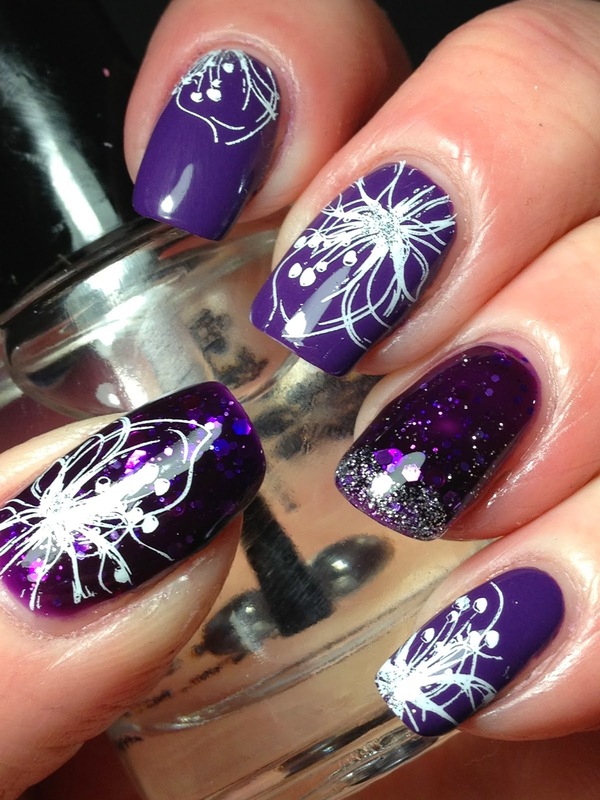 Started with a base coat of two layers of Zoya Lara, topped with KBShimmer Clearly on Top. 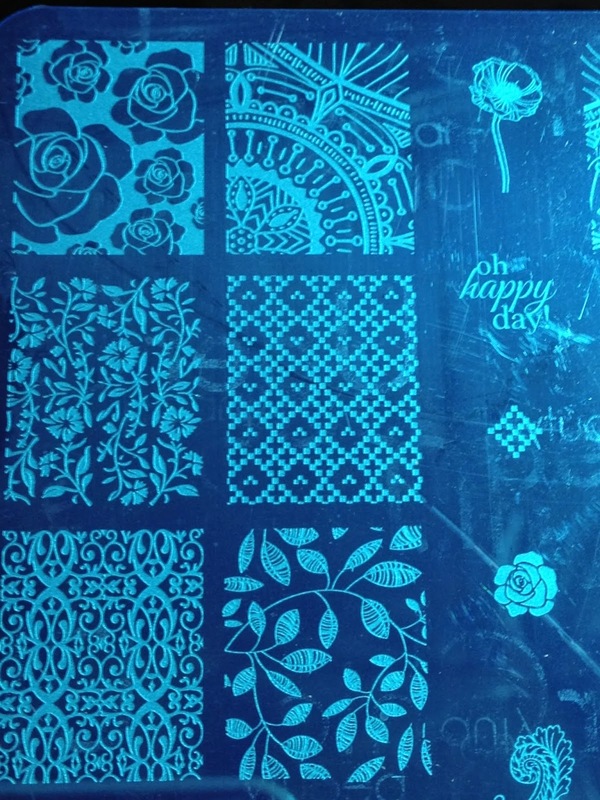 For the first patterns, stamped using Funky Fingers Dark Night using an image from Handy 24. 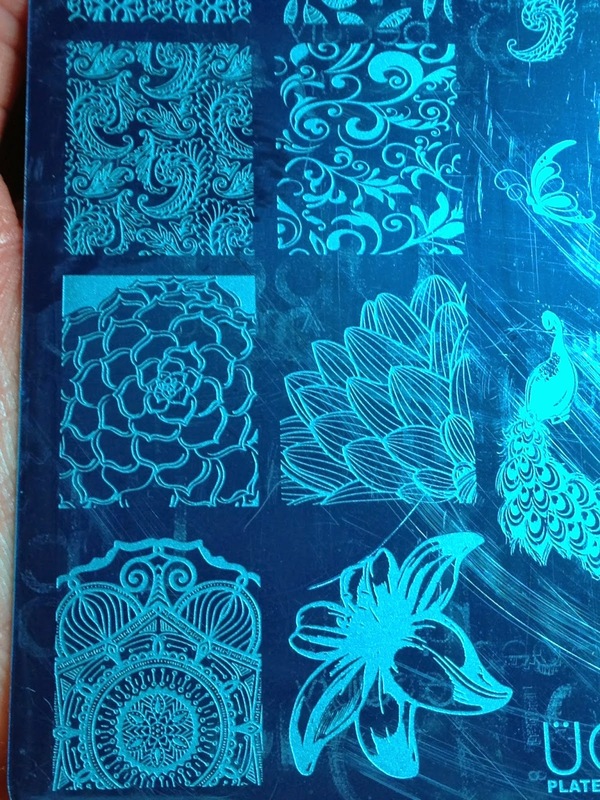 Stamped on the second pattern using same Handy plate using Funky Fingers Gesso. While I was happy with this, I wanted to take it one step further so decided to stamp on yet another pattern using Apipila P.17 using Mundo de Unas 52, then topped with KBShimmer to finish. This is over the top, but again, was just testing myself to see how far I could go with this pattern challenge! 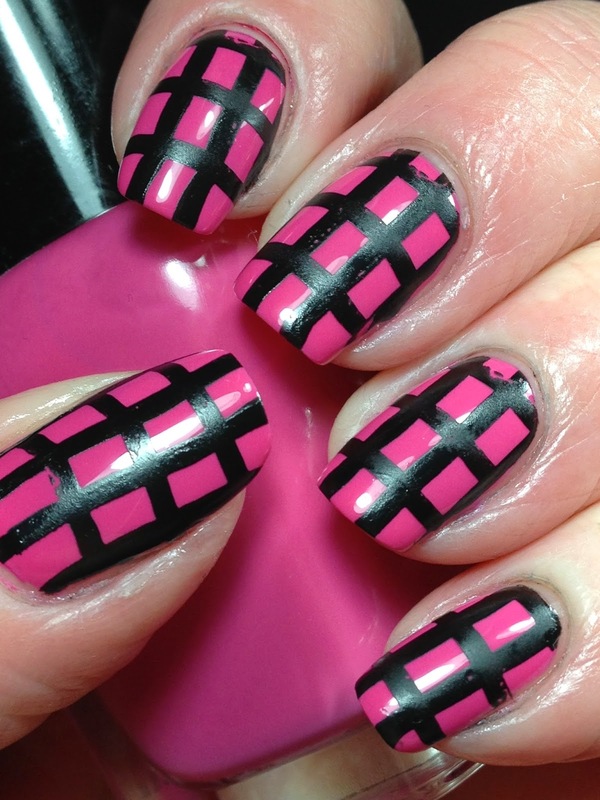 I have to show this next pix; anyone who has stamped lines knows how hard it is to line them up, get them straight on the nails above aren't bad but still not perfect. 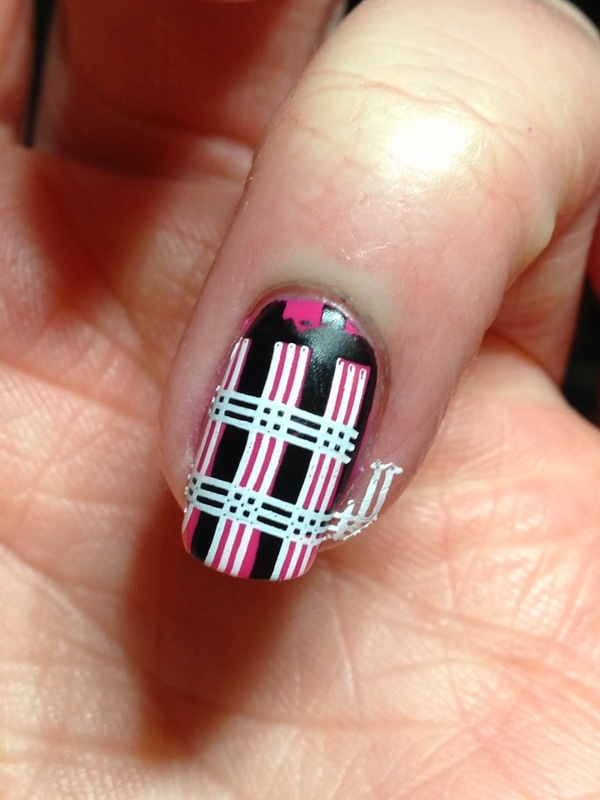 Well I stamped a near perfect nail placement wise for the lines ...but fail none the less lol. Grr...this is why I top coat my nails before stamping for easy removal. 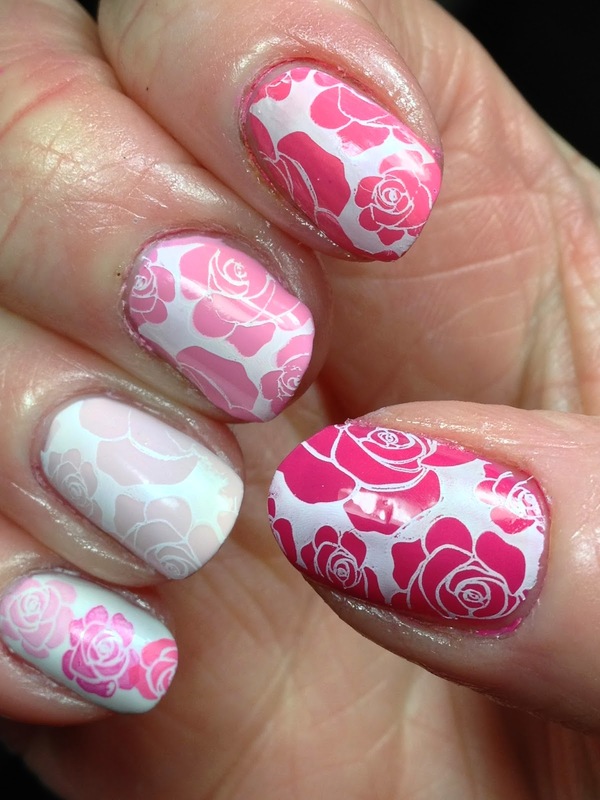 Here's the other ladies Day 5 mani's. 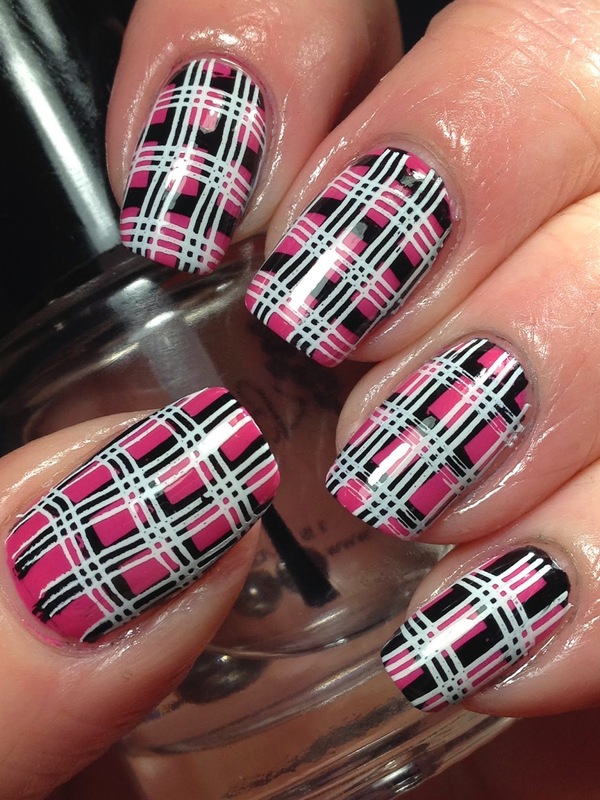 Hopefully you've enjoyed seeing every one's patterns on patterns this week!